The middleweight division might have itself a new star. It certainly has a new champion, as Rob Brant of St. Pauls in Minnesota is the new WBA “regular” champ. 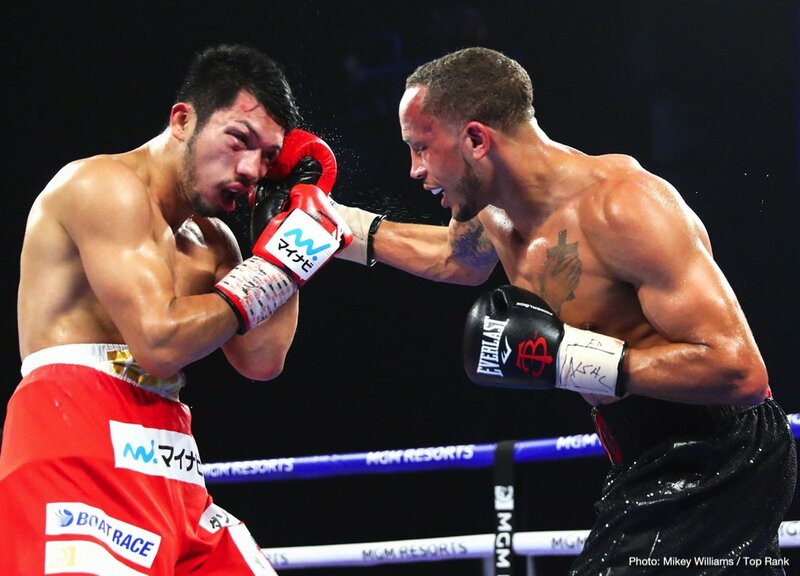 Upsetting big favourite Ryota Murata last night in Las Vegas, Brant won via lopsided 12-round unanimous decision. Scores were a wide 119-109 twice and 118-110. Brant, who improved to 24-1(13) with the win gave us some other impressive numbers: throwing as he did an amazing 1,200-plus punches throughout the entertaining battle. Murata is now 14-2(11) and it could prove a tough job for the man from Japan to win another world title. Brant, beaten only by by the bigger Juergen Braehmer, who he fought up at 168 pounds in the recent World Boxing Super Series tournament, jumped on the defending champion from the start and he simply never let up. Murata had some moments of success himself but not nearly enough. His nose bloodied, Murata was out-worked, outboxed and out-fought. By the middle rounds it was clear Murata was in need of either a couple of knockdowns or a straight-out KO, but Brant was not going to give him the chance. A fiercely determined fighter and challenger, Brant dug in when he felt fatigue and he simply wanted the win so bad. Later, Brant said last night’s win was the greatest night of his life. But could there be bigger fights and nights for the new champ? Murata, had he won, was very much in line for a big fight with former middleweight king Gennady Golovkin, next March or May. Murata has now blown that, but why not match Brant with GGG instead? With his style and his incredible punch output, maybe Brant would be able to give Golovkin – who let’s face it, isn’t getting any younger – a real test. And as for if Brant actually managed to defeat Golovkin, well, that would make last night’s big upset win look like child’s play in comparison. Most fans will probably point to new WBO middleweight ruler Demetrius Andrade as the best middleweight belt-holder aside from world champion Canelo Alvarez (who is of course going up to 168 in December, possibly never to come back down) – and Andrade against Brant would also make for an interesting match-up. Whatever he does next, and whoever he fights in his first title defence, Brant has sure arrived as a major player in the 160 pound division. And as likeable and as down to to earth as Brant is, nobody deserves it more. Fans love warriors who throw a ton of punches, and Rob Brant sure does that. Fans often enjoy witnessing an upset, too. Might Brant pull off a couple more in time?